This page contains some sample pictures of CRiSP in action. Click on the link to see a sample snapshot of CRiSP in action. MAIN1 (Win32) Snapshot of the main CRiSP screen. 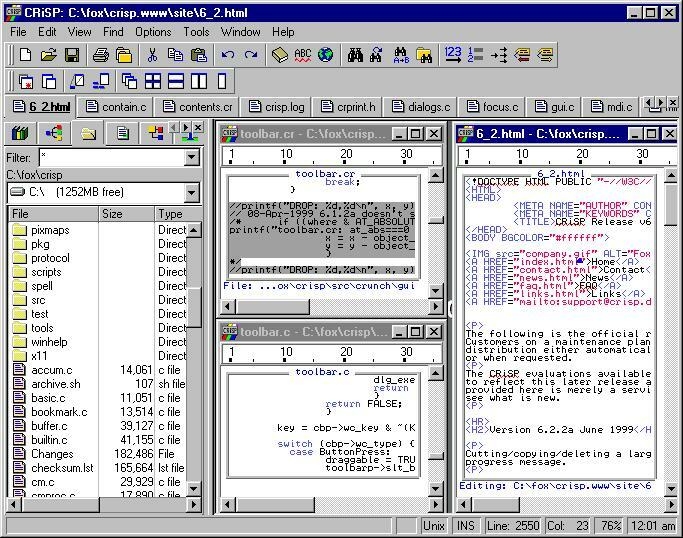 Shows the use of the contents window to view files in the current directory, the file tabs at the top of the screen for quick buffer selection and multiple edit windows open. Mac OS X - Cocoa Snapshot of the screen on a Mac OS X showing multiple CRiSP windows, and a couple of the dialogs. Autosave options This shows some of the Autosave options available. 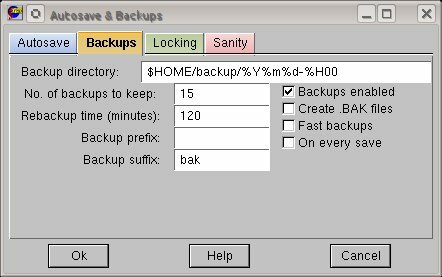 Backup options This shows some of the backup options available. Locking options This shows the options for file locking. Sanity options This shows the options available for detecting files changing outside of CRiSP. Infotips Showing a typical popup for an infotip entry. Key bindings Dialog to let you redefine the key mappings. Key settings Some of the options you can set to configure the keyboard the way you like. Lang Comments Dialog which lets you define the commenting convention on a per file type basis. 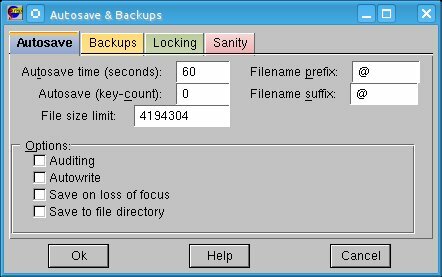 Conversions Options which can be set on a per file type basis to control the way files are readin and saved. Template editing Options for controlling template editing. Text Options for controlling the way text files are edited. Printer setup Options for printing including generating colored output and PostScript support. Project Dirs Dialog letting you define directories for a project. Project Files Defining files for a project. 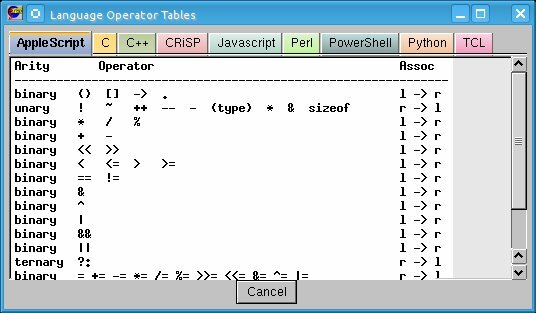 Operator Precedence Cheat-sheet showing operator precedence charts for various common languages. Project Menus This dialog allows you to define your own menu items for a project. Project settings Various options for a project. Tags Dialog showing you one way to find all definitions of a symbol. Tags Setup Dialog illustrating the options for controlling tag files.